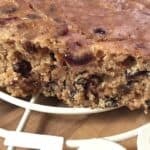 A delicious tea loaf fruit cake with festive flavours of cranberry and ginger, made in your slow cooker. Place the cranberries, mixed fruit, dates and ginger in a large bowl and pour in the hot black tea. Leave it to soak for five hours or overnight if you have more time. Add the orange zest and mix it in. Cream the sunflower spread or butter with the sugar until light and fluffy. Add the egg and beat well. Fold in the flour, cinnamon and ginger. It may appear a little dry but will be fine once you add the soaked fruit. Pour in the soaked fruit, which will have absorbed most of the tea and now be plump and shiny. Pour the mixture into a silicone baking pan (prepare the pan with cake release spray first). Place the silicone pan in your slow cooker pot (I used my large 5.7 litre slow cooker for this recipe). Pour in a little hot water around the pan. To prevent the top of the cake getting soggy, place a clean tea towel under the lid of the slow cooker, then replace the lid. Turn the slow cooker onto high and cook for 1.5 to 2 hours until a skewer comes out clean. Remove the silicone pan from your slow cooker and leave it to cool.